You might think the humble teapot is a design classic that can't be bested, but that's because you haven't seen the BKON Craft Brewer. 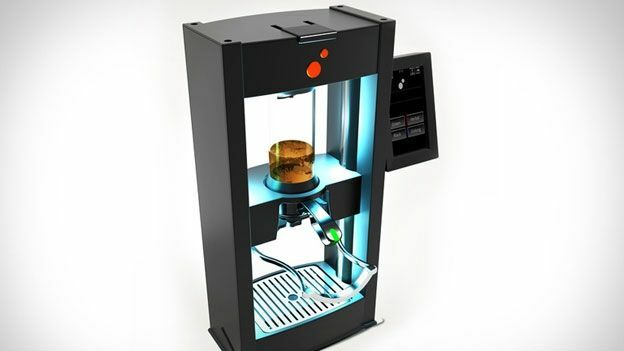 It uses a process known as Reverse Atmospheric INfusion (sic) to make what its makers claim is the perfect cup of tea in just one minute. Here's how it works. You place loose tea leaves and water in the brewing chamber, and air is drawn out to create a vacuum. That negative pressure inside the chamber causes the leaves to rise to the water's surface, and causes gases to be released from the leaves and the water. When the vacuum is released, the chamber returns to atmospheric pressure, and extracts the soluble favour elements. This process is repeated for between 60 and 90 seconds, until it achieves the optimum flavour. During this time, the machine tweaks the variables like water temperature and contact time, vacuum depth, duration and frequency. And hey presto, you've got a brew. Here's more info about the brewing process. Tea aficionados will be in heaven, as the Craft Brewer can store more than 200 recipes. To access them, just flick through the menu on the touchscreen. It cleans itself after every brew too, so every cup will taste fresh. The bad news is it's not quite ready for your kitchen yet. It's currently being trialled in select coffee shops in the US, but should be available commercially later this year. The price? $13,000 (£7,700). Just our cup of tea.